Manny Pacquiao won easily versus Adrien Broner on Saturday night without breaking a sweat. It was as everyone expected it to be. 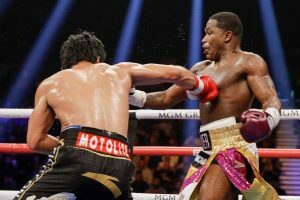 Broner should have never been matched against a volume puncher like Pacquiao at the risk of being outworked, which is what precisely happened over the course of 12 rounds. With an active legend like Pacquiao, anything less than an elite opponent does not make for an interesting fight, and unfortunately, Broner is not a top name at welterweight. Despite the expected outcome, there are things we can take away from the match and the post-fight conference about each fighter. First, let us evaluate the senator from the Philippines. It is abundantly clear after this fight that Pacquiao is still active and will fight whomever they put in front of him. He said so himself several times in the post-match presser. One may question what still drives the 40 year old Filipino slugger. It is definitely not solely money, as he has plenty of it from boxing, and he can generate more of it anytime he wants from his business endeavors in the Philippines. Also, for mega celebrities like Pacquiao, there are always ways to monetize his fame in any location. It is not solely glory either, or else he would proactively clamor for the biggest fights out there and not be happy with lesser opponents such as Horn, Matthysse and Broner. But he expressed no such interest, instead he was quite content at the matchmaking skills of Al Haymon. What drives Manny Pacquiao at this age is that he still loves fighting! Whereas many fighters grow weary of the sport at some time, or do not maintain the same level of interest as before due to injuries or increased family commitments, this is not the case with Pacquio as evident from his post fight mannerisms. Despite having a thousand and one responsibilities as a senator and public figure, Pacquiao would miss boxing too much to give it up now. These wins surely add to his legacy, but not by that much, and they do put money in his pocket, but not as much as he earned from the Mayweather fight. But he showed enough this weekend to suggest that he was still one of the best around and would continue to fight any fighter Al Haymon would give him. He did so in a style that also suggested that he is pacing himself for more fights! This is not the same Pacquiao from a decade ago who would use constantly use his straight left from far out, and throw punches constantly from multiple angles. Doing this furiously every round burns a lot of energy, and to go back and forth with worthy opponents leaves a lot of blood, sweat and toil in the ring. It leaves you with that much more scar tissue for the next fight. One has to adopt with the times, and maintaining such a fighting style to this day would prove too much to sustain for an aging Pacquiao. So instead, he was more patient, getting inside using his right jab first, and opting for fewer combinations whenever he could. He rightly judged that it would be enough to win the fight, as he said in the presser that his trainer Buboy Fernandez suggested him to not go for the KO at the risk of getting knocked out himself. More importantly, Pacquiao obeyed his instructions. This shows that he is already mentally prepping himself for the next fight, and indeed for the long haul. Raking up more wins in his record is more important right now. Adjusting to the match takes precedence over trying to impress anyone. Could it really be that he is doing all this because he loves boxing? Perhaps, love of boxing also falls short of being the sole reason why Manny Pacquiao is still fighting. If we are to believe his former promoter Bob Arum, it is because he was promised a rematch vs Floyd Mayweather. Perhaps Pacquiao is saving his best for that fight to avenge his loss. Let us turn our attention to Cincinnati pugilist, Adrien Broner. He is someone that always came up short in the watershed matches of his career, and that trend continued over the weekend. In a shocking post-match interview in the ring with Jim Gray, he claimed that he won the fight and was cheated! While such a claim seems incredulous at first, one has to understand Broner’s mindset. This is a man who is used to making comebacks after his watershed defeats. After the Maidana defeat, he went on a trio of victories before losing against Porter. After the Porter defeat, he went on an even more impressive run, beating a trio of fighters better than the last trio he triumphed against. Hence, after his defeat to Garcia, he was eying another sustained comeback, which unfortunately did not happen for him as he drew against Jessie Vargas, which was a close fight. He probably felt he got the short end of the stick in that match. He carried those sentiments with him to the Pacquiao fight, and projected his insecurities by lashing out at Jim Gray in the post-match interview. However, at the post fight presser, he seemed to have gathered his thoughts and was more reasonable in saying that he would have to review the fight. There was a transformation that took place between the time Adrien left the ring after the fight to the point when he came down and sat at the table at the post fight presser. Like Pacquiao, he too seemed to have found new wisdom regarding his new role in the world of boxing. Intrinsically, he seemed to acknowledge that his skills were not at an elite level, and that he would have to make his living in boxing by challenging fighters who are a shade below the likes of Manny Pacquiao and Mikey Garcia. Looking back at his career, he probably feels that Maidana is a fight he should have won, but Maidana is now long retired. His main weakness is a lack of productivity, so Porter was the wrong opponent for him style wise. If he is wise, he will avoid such styles in the future. Perhaps he can rematch Vargas, and look to challenge guys who do not throw as much. For e.g., boxers like Danny Garcia and Sadam Ali would be better opponents for him at 147 rather than Shawn Porter or Amir Khan. Those would be excellent and fair tests for him, and that is what AB is looking forward to. With the Pacquiao defeat, any illusions of rising to the very top has now rightly evaporated within the 4 division world champion. He still talked up his performance, which any boxer should rightly do to stay in the conversation of the best fighters today. But Broner seems to have fully accepted his ceiling with no remorse. Like Pacquiao, he too is not going anywhere just yet, but rather he is focused on beating the type of fighters he knows he can beat in the future. A rematch with Vargas is the most obvious next step in my opinion. If he can get the decision versus Vargas, he can use that momentum to then challenge the rest of the marquee names at147 who are not voluminous punchers like Pacquiao. Broner said many times that he was in the best shape of his life for this fight, and there is no reason to doubt him. But his best was not as good enough at the elite level. Armed with this invaluable knowledge, Adrien Broner will go back to his promotions team demanding easier fights. If he remains dedicated, his best may make him look spectacular in those fights, and keep him in the limelight for a future mega fight.